UFW Stories: "Why I Joined the UFW"
"Why I Joined the UFW"
I got involved with the UFW after Arturo Rodriguez held an event at my college in Minnesota. It was the first time I had ever felt inspired by a speech—not only because Arturo is a moving speaker, but because it is difficult not to be drawn in to the spirit of La Causa. I was inspired, as was so much of the campus that day, in part because the moral principles behind the farm worker movement do not only apply to farm workers themselves: they are fundamentally human principles. Health, dignity, equality and fairness, the right to prosper. I applied for an internship with the UFW the very next week. 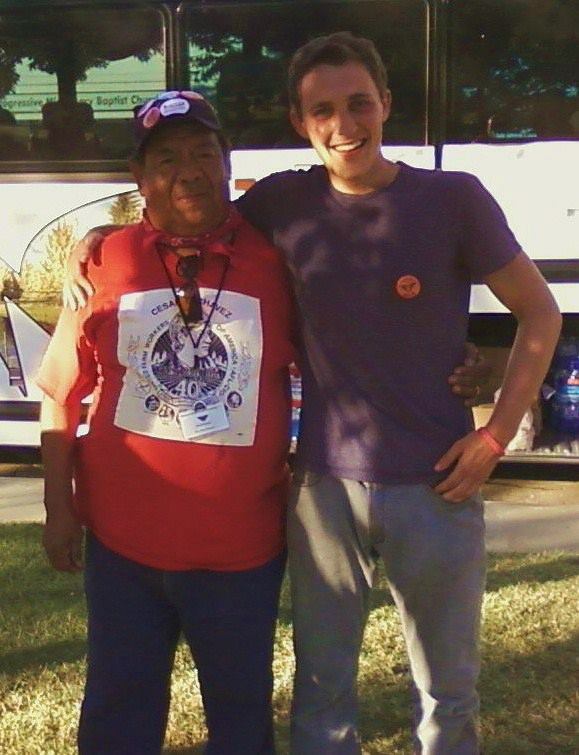 In late August 2011, I found myself participating in the 200-mile Fair Treatment for Farm Workers peregrinacion from Madera to Sacramento; this was my first hands-on experience with the movement. Granted, I did not walk 200 miles: I drove a bathroom truck and handed out water. I even gave some unexpected port-a-potty rides when I was not paying attention. But the others did walk, many of them farm workers, and not all of them union members. Several marchers were well into their 80s. They walked along fields and highways, downtowns and front yards. Residents of towns and cities along the march-route saw the very hands that pick their food every day. It was this march that caused Governor Jerry Brown to sign SB 126, a crucial piece of legislation for the future of the farm worker movement. The peregrinacion was my first experience with the UFW, and my first chance to see first-hand the incredible truth behind Arturo’s speech. I am still dedicated to the farm worker movement, 7 months later, and still motivated by the same feeling of inspiration that first captivated me.